If you are looking to implement a new manufacturing ERP system, or are simply trying to upgrade your manufacturing ERP system, it’s easy to feel overwhelmed by the number of options available. There are a great deal of ERP systems that specialise in the manufacturing industry. However, it remains true that some manufacturing ERP systems are still better than others, especially when it comes to specific areas of the manufacturing/sub-contracting field. For instance, Quality Control, production control, Materials & Inventory Management, Multi-Plant / Site Operations, or Discrete vs. Process manufacturing. When evaluating ERP software for your manufacturing company, it’s important to have a list of prerequisites to determine which vendors make the cut. Here are just a few ideas to get you started. Materials planning and costing (MRP) – MRP allows your products to be scheduled and forecasted produces a complete material plan which determines the quantities and delivery schedules of needed components. Shop Floor Management / Shop Floor Control – Shop Floor Control is a real–time database of shop floor activity including new work, current work–in–progress and completions. As work moves through the plant and operations are completed, you receive instant feedback so you can respond effectively. Quality Management – Quality Management allows manufacturers to monitor quality through the manufacturing process. Lean manufacturing – Lean manufacturing is a communication system that controls the flow of the shop and synchronises the level of production to customer demand. Process Automation – Automation saves time and eliminates human error. It helps to free up administrative hours that can be invested into higher-return activities. Also, streamlined processes allow access to real-time data and thus enable businesses to have better control over all practices in the establishments. Manufacturing software / ERP applications can quite literally have hundreds of different features and you may not necessarily need every single one of the features that are listed above. In fact, depending on your industry or niche, there may be features that are not listed here that you will require in your ERP manufacturing solution. 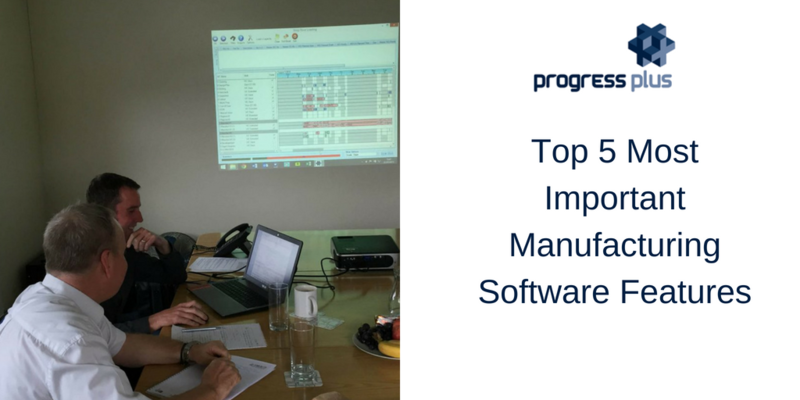 However, this list is certainly a good place to get started when beginning your search for new manufacturing software.